If you send someone to the store to purchase something for you, how do you describe the product to them? Brand name, size or shape of package, color? Color is a critical design component for packaging. Different colors elicit different meanings, feelings, perceptions on the part of the viewer. "Color communicates psychologically by creating a mental association. This mental association with color is what determines an individual's perception of an object or its surroundings" (Climchuk & Krasovec, Packaging Design: Successful Product Branding from Concept to Shelf). 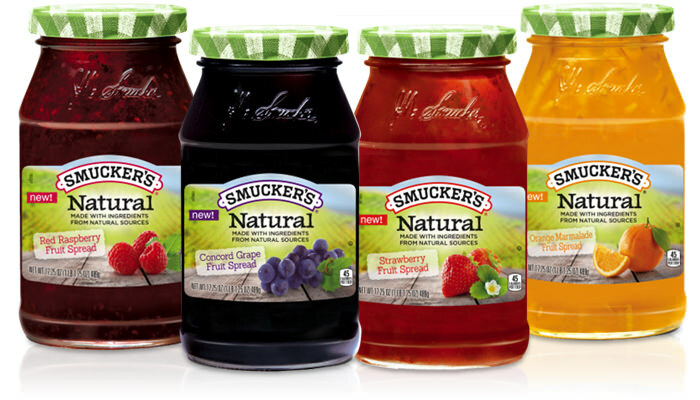 When is comes to food products, color is widely used to illustrate flavors in food products. We see this exemplified in the image to the left. 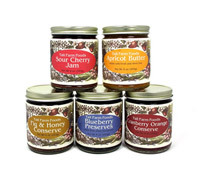 Each product, while having the same basic label, is differentiated by the use of a color meant to represent the flavor of the jam/preserve. Since consumers rely heavily on color to identify products and make purchasing decisions, you should invest considerable effort to determining the color scheme that best and most effectively conveys and elicits the perceptions you intend. Let's talk about what different colors can mean, or feelings that can be associated with them. Do Bob's overalls make you hungry? Red. Red can be associated with numerous meaning or feelings; heat, aggression, danger (Stop signs/light, anyone? ), excitement, power, and love (it is the dominant Valentine's Day color!) are just some. When associated with food, the color red has also been shown to increase appetite, hence the reason it is widely utilized in the fast food industry. Orange. Falling between red and yellow, orange combines some of the associations from both those colors. Feeling conveyed via orange include cheerfulness, energy, and enthusiasm. Orange can also be seen as a commanding color, as seen by it's use by road crew workers, so it can be useful as an accent color to draw attention. Yellow. Yellow is generally perceived as a positive color, conveying happiness, optimism, warmth, and wholesomeness. Green. Green is increasingly being used on food packaging to denote healthiness since the color is closely associated with nature and the environment. Compare the use of green in the two images below. In the image on the left, we see very little use of green, while in the image on the right, Smuckers has replaced the traditional flavor-related color on the lid with green, in addition to incorporating a green background scene, in their effort to highlight the "natural" designation of that product line. Blue. Though not heavily used in food packaging (except for maybe skim milk and fat-free products), blue is the most popular color in the U.S. Blue is often seen as a calm, cool, relaxing color, but may also denote sadness or solitude. It is also a color that represents authority, dignity, and wisdom - think of blue suits worn by professionals. Purple. Historically a difficult color to obtain naturally, purple is often associated with royalty, luxury, spirituality, and bravery. 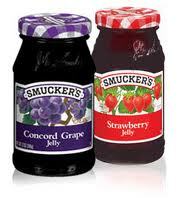 Shades of purple are often used to denote berry flavors in food products. Brown. Like green, brown is also often identified with the earth and nature. It's no wonder we see many products that want to be recognized as natural, organic, healthy, and the like, use these two colors in their packaging or labeling designs. Black. Tuxedos, black tie and tails, black pearls...items that symbolize power, wealth, sophistication. Black is often seen as a reliable color to indicate luxury or high-quality items. 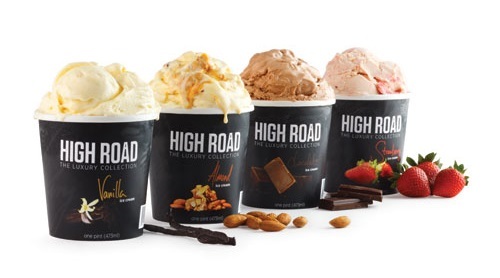 The ice cream in the image to the right most likely would be viewed (from just the packaging) as being higher quality than your typical store brand ice cream. As noted by the authors of Packaging Design, using black in packaging can enhance the use of other colors, making those colors "pop" out to the consumer. White. The last color we'll cover, white, is one that can easily work for you or against you. Often symbolizing cleanliness, quietness, purity, or freshness, it can also come across as nondescript and generic. If you're considering white for your primary package or label color, you may want to take into account how often you think the product will be handled or where it will be stored/located. The last thing you want is for your product to appear dingy or dirty to the consumer.